Reverend Gotvin Soleng is a resident of a small mountain community in Norway. After completing his studies he returns home with virtue and faith intact; and becomes the local vicar. Gotvin is passionate about science, and has started to doubt miracles. It is this doubt which inspires him to do his first trip abroad, to Santiago de Compostela, where the Virgin Mary recently has materialized in the skies – to great satisfaction for the visiting pilgrims, and horrifying for a group of Japanese tourists. During this journey Gotvin´s Christian faith begins to fail, and he also loses his long time accumulated virginity. On the train down to Santiago he is sitting in the passenger compartment with a woman who is going to change his life. After this meeting, he can not recognize himself. He, who came to break out in a sweat just by the smell of a woman (while the smell of freshly caught trout makes him smile), resistlessly lets him self seduce in the park outside the city’s municipal swimming pool. His seducer is not just anybody- she is a paleo-archeologist, university employee and a specialist in the quaternary period and the neanderthals. She gives him a drawing, which cryptic content she is asking him to dechiffer. It turns out to show a number of Viking castles in Denmark- which are all on the same latitude. The action takes place between Gotvin´s home in Norway and various European cities (in addition a quick visit to Egypt)- so lively and imaginative that it could make John Irving blush with envy. Along the way; Gotvin experiences heavenly happiness and deep despair. He is suffering existential anguish and passion when he discovers the holy, geometrical principles behind both the ancient cult places and newer church buildings, which seems to be the same. In this context both architects and physicists play an important role. In pursuit of the golden ratio and all sorts of things related; Gotvin comes to challenge our established view of the world, such as many of Nygårdshaug´s characters do. 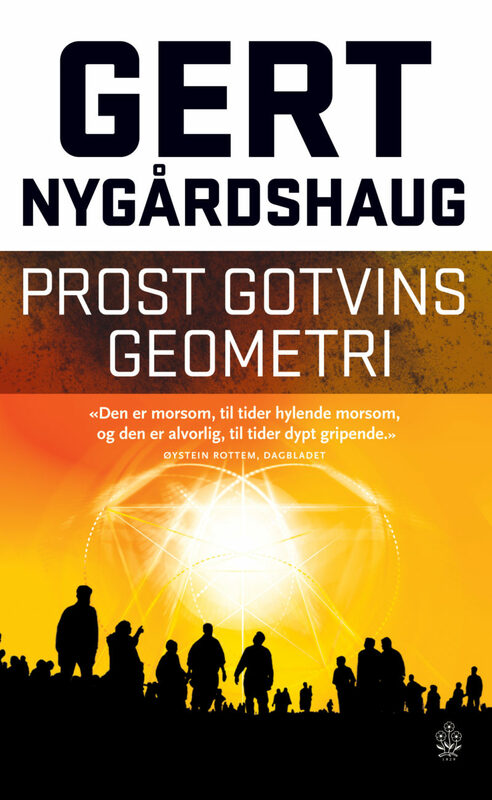 With "Gotvins Geometry", Gert Nygårdshaug has confirmed his position as one of our greatest novelists in time. Deep and bold thoughts, bubbly humor and great perspective entertains us in this novel. He is so wonderfully curious about the mysteries of life and the universe, and he daringly throws himself out in the peculiarities of our existence- in Nygårdshaug´s well-known, charming style.